Get seen handing out dollars stuffed full of jelly beans. Make a big bang with the promotional Jelly Beans Acrylic Dollar Sign. Get the attention your need at that next trade convention with the promotional jelly beans acrylic dollar sign. This cool looking promotional product is a great way to get your brand noticed during events and corporate functions. Use the branded jelly beans acrylic dollar sign and you’ll definitely be scoring new contacts and business deals. Look inside the container and you’ll see the glossy and enticing multi-coloured jelly beans. These jelly beans have always been a classic favourite and can win you the hearts of many. Just print your design or your corporate logo on the sticker and we’ll slap it on the see-through casing. To add some more impact, have the jelly beans inside in the colour of green. Now that’s a giveaway that really screams for attention. Take the custom jelly beans acrylic dollar sign to any event and people will be talking about you. With cool looking presentation and delicious goodies inside, you’ll definitely gain a following. What’s also great about this promotional product is its value proposition. This gift item that looks like a dollar would actually not cost you a fortune. That’s right, you can have a winning promotion while at the same time save on your marketing budget. You just can’t go wrong with that. Another cool packaging idea you could also consider is the branded Jelly Beans Acrylic Stars. Or if you want something fit for the coming holidays, the promotional Christmas Jelly Beans Soda Bottle would be perfect. Do keep browsing our online jelly bean store catalogue to view the rest of our lineup. 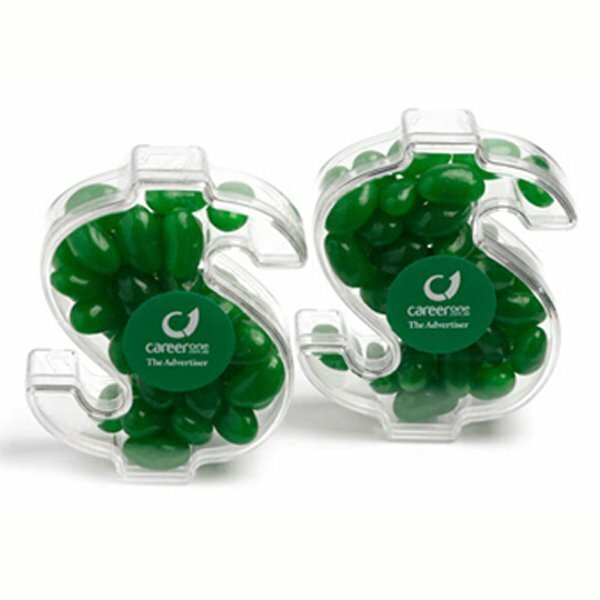 Catch your clients’ attention with our promotional Jelly Beans Acrylic Dollar Sign. These confectioneries will be one of your best marketing investments! For other advertising ideas and giveaways, check our Youth GI Jeep Cap and our line-up of customizable hats, caps and other headwear. We have our customer service agents ready to assist you in case you have questions. You can hop on that chat box on this window, or you can also contact us via our hotline number, 1300 008 300. We’re always looking forward to hearing from you.